Amazing... read on please & it's not an April Fool's joke. Twin girls, Brielle and Kyrie, were born 12 weeks ahead of their due date. Needing intensive care, they were placed in separate incubators. Kyrie began to gain weight and her health stabilized. But Brielle, born only 2 lbs, had trouble breathing, heart problems and other complications. She was not expected to live. Their nurse did everything she could to make Brielle's health better, but nothing she did was helping her. 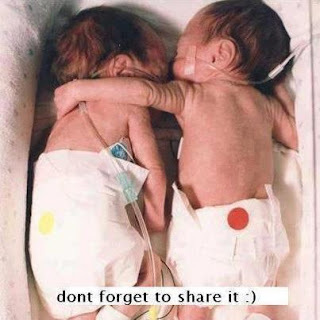 With nothing else to do, their nurse went against hospital policy and decided to place both babies in the same incubator. She left the twin girls to sleep and when she returned she found a sight she could not believe. She called all the nurses and doctors and this is what they saw. As Brielle got closer to her sister, Kyrie put her small little arm around her, as if to hug and support her sister. From that moment on, Brielle's breathing and heart rate stabilized and her health became normal. 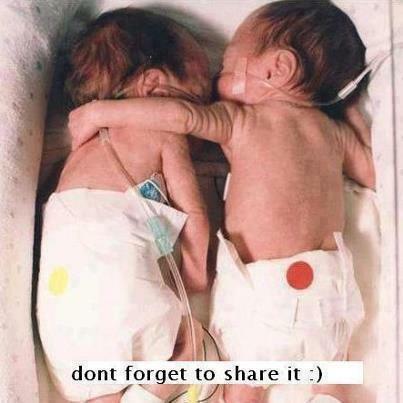 Share the pic to show the world how a little bit of tender love and affection can save someone's Life.